We may well jest about that Geoff Hurst goal in 1966 (the year I was born) but it’s not that funny really, is it? That just happened to be the World Cup final, the most important game of football anyone can take part in. What if the ball hadn’t actually crossed the line and it wasn’t a goal? That could have affected the whole game and seen West Germany go on to lift the trophy. It’d be more than 50 years of hurt for England if that had happened. Other sports use technology and it’s only right that games are decided by what actually happened, not what the officials believe took place. Of course, it’s not available for every game, cost totally prohibits that with installation and testing costs to pay before the FIFA quality seal can be given for Hawk-Eye’s camera based system. That can amount to around £250,000 per camera so that means the vast majority of clubs will still lose out on goals that should have been given but aren’t. Not every major league has this technology though and amazingly, La Liga is on that list. 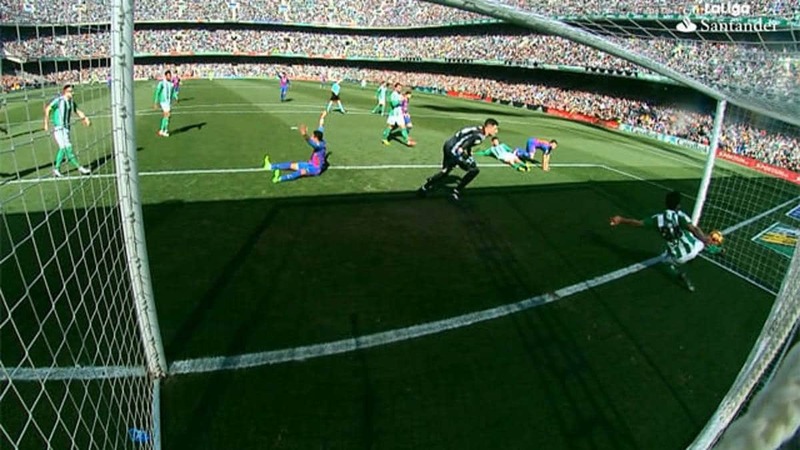 Recently, FC Barcelona had a clear goal disallowed against Real Betis. There was no high-tech, objective way to decide whether it had actually crossed the line, so the Barca goal wasn’t allowed. Will there be similar problems when leaders Real Madrid host RCD Espanyol on 18 February? They are 2/9 with Betway to win that game but clearly it’s not only the outcome of the game but the outcome of punters’ bets that could be heavily influenced by the lack of goal-line tech in La Liga. Systems in use are camera-based or use magnetic fields. Cameras can detect the ball and use software to determine whether or not the ball has in fact entirely crossed the line. This can use seven cameras per goal to ensure every chance of the right decision being made. Several systems use magnetic fields in this instance, with cables being placed under the pitch and the ball having receptors. It all sounds rather technical and of course it is, but as long as it means the right decision is made, then that’s the way it’s going to be. Should it just be limited to those who can afford the technology? Surely, if the game can be videoed, then an official can just look at the action replays in order to make a decision. OK, it’s not as high-end as magnetic fields (most people think that’s a Jean Michel Jarre album) but it’s still better than what we have at present. Technology partners worked closely with the IFAB and FIFA to make sure that any GLT system would work in a variety of environments and situations. Why should all this technology be limited to goal-line decisions? Can’t the technology we have look at other areas of the game? How about that foul that might just have been committed inside the penalty area but saw a free-kick given? That decision can totally change a game if a penalty is given and a goal scored. Again, let’s have football decided by fact, not split-second opinion. Then there’s the thorny subject of diving or flopping. If there’s one ill in the game I’d love to see eradicated, that’s the one. Again, this can result in penalties either being given for no reason or legitimate claims resulting in a booking for a dive that never was. How long would it take for an official in the stands to check the replay and decide the real decision to give? Unsportsmanlike conduct fouls are another game changing plays often missed by officials when it occurs away from the ball. Players that knew the video assistant referee was always watching them would deter these kind of harmful plays from happening in the first place. You can argue that all these decisions will slow the game down but other sports use the technology – and in an entertaining way too, especially cricket and rugby league. What takes longer? The time to make the right decision or the endless rows that you have in the pub about the goal that should have been and the one that wasn’t? A Brief History of Technology in Sports – SportsTechie blog. Sports Techie, the margin between a win and loss in soccer is often just a single goal. Some football matches even end with a 0-0 final tally. In a 1-o match, that one goal obviously makes all the difference. Therefore, using GLT is a real no-brainer to ensure any and all goals scored or disputed are legit. FIFA World Cup officially started using GLT during Rio 2014 and has not looked back. After the first goal is scored, coaching strategies often change. Teams that score the first often change tactics and sit on the lead by dropping back more defenders into defensive formations attempting to maintain the one goal edge. Many fans cringe when this happens because a high scoring match now seems distant. Other top scoring offenses press the pace when they have a single goal lead and try to score again in an attempt to put the other team away. Fans love this strategy because more goals are one the way in theory. When a team falls behind they either add more forwards and press the action trying to get the equalizer or they too play defensive tactics hoping to keep the score close enough that a counter attack can equalize the score at 1-1. The same can be said for a low scoring hockey game and even baseball if two pitchers are tossing shutouts. It is rare for an American football game to end in a 0-0 score at the end of regulation but it happens. Basketball never ends 0-0 or 1-0 making that sport not part of this conversation. The point is, a single goal or point is critical to the outcome and standings of the Premier League, Bundesliga or MLS so the referees better get it right. I find it extremely hard to fathom that leagues and team owners will pay millions in salaries and transfer fees while earnings millions if not billions in broadcast revenue and yet, there is still opposition towards implementing GLT as is the case in La Liga because of cost. Bring in a happy GLT sponsor to help offset costs if need be, just make it so. Humans make mistakes and refs are often plain wrong as history shows. The use of advanced sports tech systems and products to tell the truth is the right thing to do going forward because every single professional football match deserves this treatment no matter what the cost because one goal truly means everything. Technology has changed sport and football should embrace it more than just GLT.